In mid-November, while Americans were preoccupied with election returns, China sent some of its clearest signals yet that it will continue to pursue an international leadership role on issues including climate. At an international climate change summit in Marrakech, the Chinese government reasserted its commitment to reduce its greenhouse gas emissions. The government announced that its aggregate emissions will peak by 2030 or earlier, and that its emissions per dollar of economic output will decline sharply. For 25 years I have taught my economics students that climate change represents the ultimate “free rider problem.” To slow global climate change, we need to reduce aggregate global emissions. Yet each individual nation’s efforts are too small to “solve” the problem, so it has only weak incentives to take costly mitigation actions, and strong incentives to “free ride” on the benefits of emission reductions by other countries. From this perspective, President-elect Trump’s pledges to “cancel” the Paris Agreement and dismantle President Obama’s carbon mitigation initiatives follow standard economic logic. If the United States backs out of commitments to reduce national emissions, it still benefits from other countries’ efforts. Why, then, is China is pressing ahead with low-carbon initiatives? My research suggests several motives. Chinese leaders want to improve the quality of life in their nation’s cities by reducing air pollution; win large shares of promising export markets for green technologies; and increase China’s “soft power” in international relations. Taking aggressive action to cut carbon emissions helps China in all three areas. Much of the staggering rise in China’s carbon dioxide emissions in recent decades came from burning coal to produce electricity for the nation’s industrial sector. While this growth has created millions of jobs and wealth for the nation, coal-fired power plants are major sources of greenhouse gases and conventional air pollutants that affect millions of people. A large body of research, including joint work by U.S. and Chinese scholars, has demonstrated that air pollution in China causes thousands of premature deaths yearly. Coal also provides winter heating in China’s colder cities. Recent epidemiology research has found that coal use for heating greatly increases fine particulate air pollution, which has raised morbidity and mortality rates. Using data from around the world, economists have found that when countries develop economically they move up an “energy ladder.” As a nation grows richer, it tends to substitute more expensive but cleaner fuels such as natural gas for cheap, high-polluting fuels like coal. A natural experiment that occurred in Turkey as natural gas pipelines were built throughout the nation between 2001 and 2014 showed as people gained access to natural gas, air quality improved and mortality rates declined. China has more coal than natural gas resources, but as its citizens grow wealthier, their willingness to pay to avoid pollution increases. This trend will encourage substitution toward cleaner fuels. As such, China’s political leaders will likely prioritize policies that substitute natural gas for coal, which should reduce air pollutants and greenhouse gas emissions. 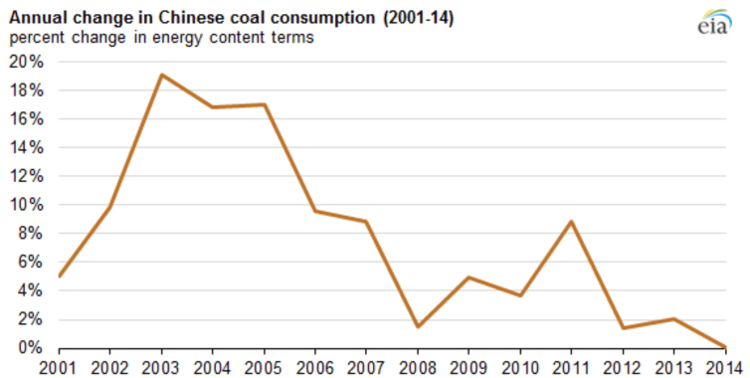 Economic deceleration, industry restructuring, and new energy and environmental policies have slowed the growth of coal consumption in China and are also driving more centralized and cleaner uses of coal. China’s economic growth has been fueled by manufacturing for export. Now it faces rising competition from other lower-cost manufacturers that produce cheap goods such as sneakers and clothes. In response, China is seeking new export markets. Electric vehicles, solar panels and wind turbines represent promising markets in a world with ample demand for lower-carbon transportation products and power-generating capacity. Trade economists have posited that there is a home market effect that drives certain large industries to concentrate in countries with large domestic markets. Firms in these industries gain experience in producing low-cost, high-quality products by selling to home markets. After they go through this process of learning by doing, they turn to exporting. China’s Communist Party (CCP) has offered special incentives, including free land and low interest rate loans, to businesses in the green energy sector. By providing these cost advantages, the CCP hopes to give Chinese manufacturers a first mover advantage. And with the rise of China’s universities, China is now home to a huge number of engineers with the training and expertise to compete with Japan and South Korea in developing new technologies. Over 21 million new cars were sold in China in 2015. China uses more oil than any other country except for the United States, and is projected to become the world’s top oil consumer by 2034. This outlook gives Chinese leaders a major incentive to develop green transportation. China’s central government is offering direct subsidies to people who purchase electric cars, and many major cities are offering tax incentives for local automakers to produce and market electric and hybrid vehicles. Such policies have helped Chinese electric car and bus maker BYD become the largest electric vehicle producer in the world. China is also seeking market dominance in clean energy technology. The nation’s ambient air pollution and its greenhouse gas emissions would both decline if China could produce more electricity using clean renewables rather than relying on coal. It has been the largest producer of solar photovoltaic cells in the world since 2007, and overtook Germany as the nation with the largest installed photovoltaic capacity in 2015. U.S industrial regulators have accused China of engaging in predation and dumping low-cost solar panels that compete with U.S products. But environmentalists should cheer that potential buyers in importing nations now face lower prices – especially global companies like Wal-Mart which are pledging to shrink their carbon footprints. As the price of renewable power equipment declines, the law of demand predicts that more U.S. companies will go green. There is a key synergy between electric vehicles and green power generation. As studies have shown, driving an electric vehicle that runs on electricity generated from coal can produce more greenhouse gas emissions than operating a conventional gasoline vehicle. If Chinese exports of electric vehicles and renewable generating technologies lead to their joint adoption by suburbanites, greenhouse gas emissions from both transportation and power generation will fall. For decades, the world’s media have portrayed China as a bully and trade cheat abroad and a repressive power at home. In cutting carbon emissions, the Communist Party seeks to boost its own political legitimacy in the international arena as well as with the Chinese people. By committing to pursue ambitious environmental goals, Chinese leaders hope to signal to both domestic constituents and international actors that China is an international leader and cares about its own people. A “leading nation” plays an active role in international relations, helps to keep the peace and promotes global public goods. At a time when the United States appears to be stepping back from its leadership role, the CCP may see a chance to fill the vacuum, and make money in the process.